27 - Hey You ! When I started this blog quite a while ago, I kept saying The Thermals' show at Haldern Pop Festival 2009 was one of my all time favourites. 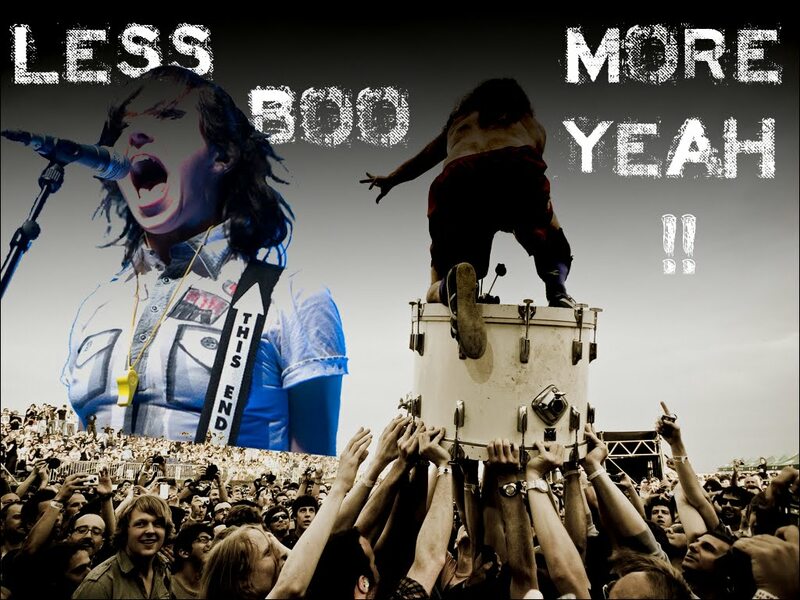 After some years attending concerts and watching live footage I still mean it today. The band has issued two albums since and Kathy's bass is still round as ever, Hutch's voice keeps sounding sharp and Westin still has itchy hands and feet to pound his drumkit. They have stuck to their low-fi-indie-punk guns and they've even been recently joined on a common tour by Jessica Boudreaux from Summer Cannibals on second lead guitar to amplify the noise. This is this 2016 line up we have here with the four songs from the "Last Call with Carson Daly" show. 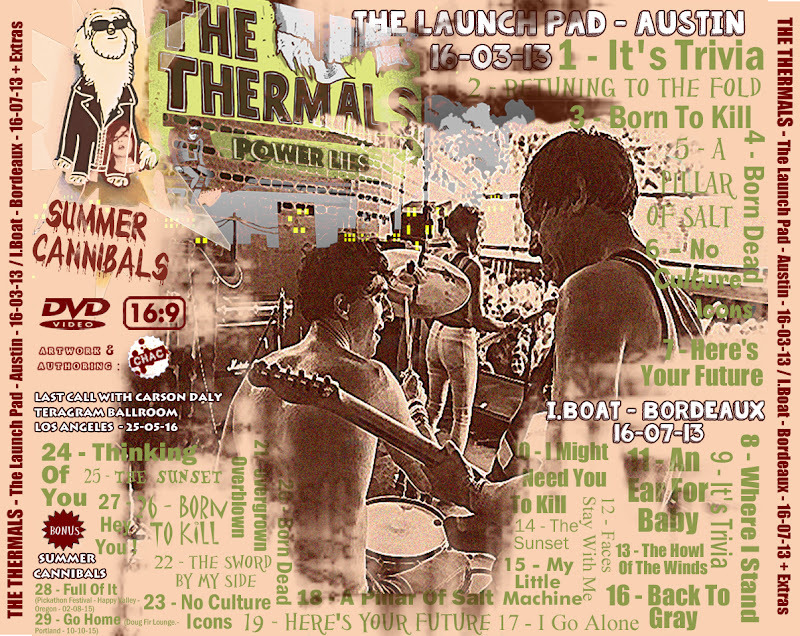 As for the Launch Pad set in Austin, it is just "full of it". Short but fiery and intense, still in this Ramones-like chain of songs (seven in seventeen minutes !). Adding a couple of stage divings from Hutch and Westin and a guy from the audience taking it over at the mic to sing along the closing chorus of "Here's Your Future", you end up soaked in sweat just watching it ! 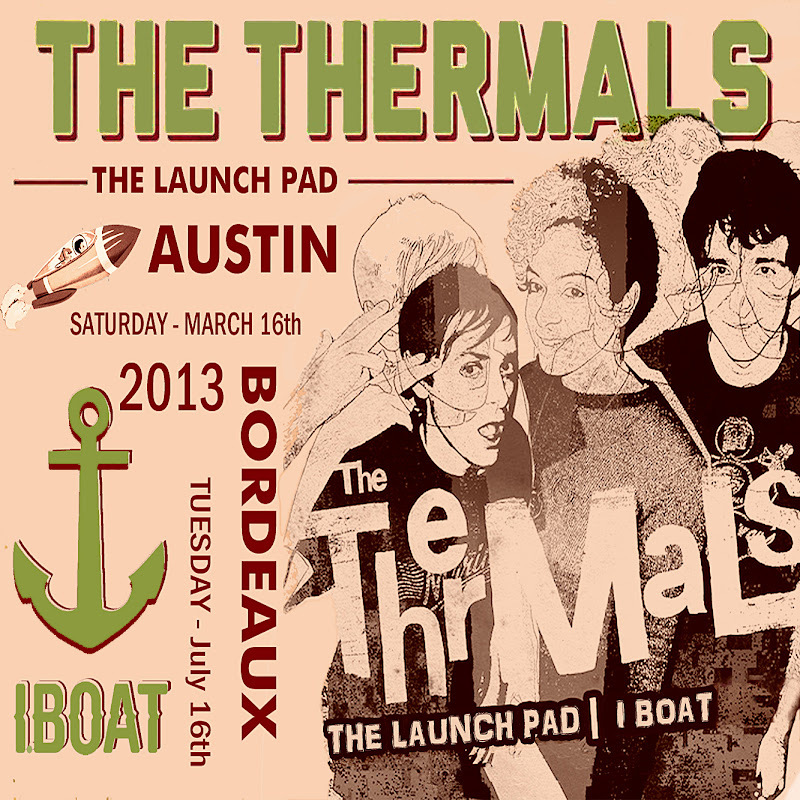 The Bordeaux show may be less rowdy (Are The Thermals less popular in France ...?) but is clearly dear to me as it was my second meeting with the band. This time I drove down two hundred and fifty kilometres to see them in an unusual venue for a gig, the hold of a boat tailored as a small concert hall. The show was stiff and straight, just as Thermals' sound always is. It was also a good opportunity to meet again my good bootlegger friend Laurent who doesn't miss many concerts in the area ! I shot a few videos of the show to keep a souvenir of the night (the band doesn't unfortunately come over that often !) but also fully enjoy the show stomping, twisting and dancing (you can hear me screaming "Back To Gray" before they start playing ... "Back To Gray". I'd revised my setlist ! ;-)). I also noticed a guy I didn't know in the audience, much closer to the stage than I was, who was using a much better camera than mine (hi, & thanks, Pascal !). At the end of the gig I ventured myself to come up to him. We quickly agreed on the fact we'd both enjoyed the show and he kindly accepted to send me what he had shot from the set. So, after years gathering dust on shelves, here is the final editing of what we both have. I've mixed the two sources, mine and his but didn't go for hassling multicam stuff this time (as I did for the IAMX dvd in Paris) since we were both standing in the same area of the venue. I've also decided to top all this with two great songs from Summer Cannibals' last album, particularly "Full Of It", shot at Pinkathon (What a great setting this festival has !! Wish I could go one day !!). The two bands have got closer to each other lately and Hutch is even producing their new album now. I unfortunately missed Summer Cannibals in october for their first European tour. I initially decided to take on a long drive again to see another Portand band but they eventually had to pull out of their remaining dates for family purposes. So, 2017, a Thermals year ? An extensive European tour along with Summer Cannibals ? I definitely look forward to it ! Sometimes you may feel at home abroad feeling as an outsider with some recent events from your own country ! Crossed fingers ! On a technical side, again this one required its amount of "pigheaded" stubbornness. The soft kept crashing for 3 days in a row ! After countless of working around tricks and several reinstallations, I finally had to cut down the number of chapters more drastically to keep away from an umpteenth crash message. Anyway, it's now yours. Hope you'll enjoy !